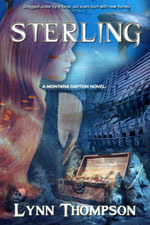 I am the author Sterling, but the hard back book sold through Amazon is sold through a third party. I have no idea who the third party is and do not receive any part of the royalties from the sales of this hard back copy. I am not responsible for the risk any persons or person is taking by buying the hard copy from an unknown entity. “You know I saw her,” Sam said cramming her mouth full of cookies. “Anyway there I was trying to figure out how to get your attention, and where I could clean up before I did when this red headed girl started walking towards the wall.” She stopped and pointed to where the hidden room was.